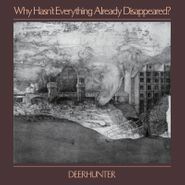 Deerhunter’s eighth studio LP, Why Hasn’t Everything Already Disappeared?, is a near-perfect encapsulation of its historical moment and its physical environment. Often bleak and always devastatingly beautiful, the album was recorded in the artsy desert destination of Marfa, TX, with longtime co-producer Ben H. Allen III behind the boards. The LP features the considerable talents of Cate Le Bon and Ben Etter, who add mood and magic to the proceedings. Quietly baroque and casually dismal, lyrical inspiration comes from climate change, the murder of British MP Jo Cox, the final days of James Dean, and the 1917 Russian Revolution. The melodies sound soft, sensitive, and sincere, and they’re made all the more powerful by this heady brew of ideas.